“Yeeeess ...” said Reg’s voice from the kitchen. “Well, Gordon’s great insight was to design a program which allowed you to specify in advance what decision you wished it to reach, and only then to give it all the facts. The program’s task, which it was able to accomplish with consummate ease, was simply to construct a plausible series of logical-sounding steps to connect the premises with the conclusion. “It was,” said Richard hesitantly. “The entire project was bought up, lock, stock and barrel, by the Pentagon. The deal put WayForward on a very sound financial foundation. Its moral foundation, on the other hand, is not something I would want to trust my weight to. I’ve recently been analysing a lot of the arguments put forward in favour of the Star Wars project, and if you know what you’re looking for, the pattern of the algorithms is very clear. Dirk Gently’s Holistic Detective Agency, Douglas Adams, 1987 (pp. 55-56). This chapter describes the LR access mechanism which is implemented for persistent LRs. At present there are two LR persistency storage methods: Java serialisation and Oracle. Here we will describe their security features in turn. At present the security model is not implemented for Java serialization. One should rely on the security control offered by the OS in order to restrict access to certain persistent resources. Warning: These features will not work, unless you have an Oracle pre-installed at your site1 and you, or an administrator at your site, has installed the GATE Oracle support (see http://gate.ac.uk/gate/doc/persistence.pdf). Oracle datastores have advanced LR access rights based on users and groups, which are similar to those in an operating system such as Linux. In order to be able to access an LR stored in an Oracle datastore, a user needs to supply a user name, password and a group. These credentials are used to determine which LRs are accessible to this user for reading and writing. users - they are identified by login name and password (each limited to 16 symbols). A user may be member of one or more groups. groups - identified by name (up to 128 symbols). session - each user must log into the datastore (by providing name, password and group) in order to use its resources. A session is opened when the user logs in. The default inactivity period after which the session expires and the user should log into the datastore again is 4 hours. access modes - there are four access modes in the present implementation. The access (Read/Write) to a resource according to its owner and access mode is shown in Table 14.1.
super user - ADMIN, password ’sesame’. The superuser is similar to the root user in Unix and has access to any resource despite its access mode.This user can also create or remove other users We recommend that you change the password of the superuser immediately after you have installed the Oracle support for GATE. 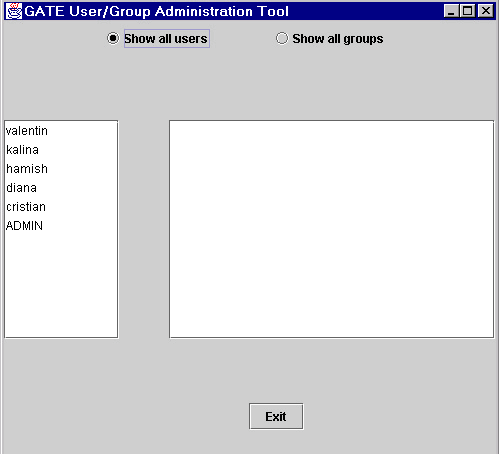 When GATE Oracle tables are first created with the database install scripts, they only contain the ADMIN user which is the only user who can create and modify users and groups.2 We do not recommend using the ADMIN user to store/access LRs in GATE. The example entry shows that there are two databases configured for this site, one at each URL. There is no limit to the number of Oracle databases one can have, but they all need to have an attribute starting with ”url”, e.g., url1, url2. To run the tool, call the gate script with the -a parameter. When the tool starts up, it first asks you to select which Oracle database you wish to administer. All databases defined in the ¡DBCONFIG¿ section of gate.xml will be shown in a listbox. Once the database is chosen, a login dialog is shown, asking for the user name, password and group of the ADMIN user. The initial password of the ADMIN user is sesame and the group is ADMINS. We advise that these are changed, the first time this tool is run. As shown in Figure 14.1, the user/group administration tool (called the UG tool for the rest of this section) consist of two parallel lists. By default, the left one shows a list of all users in the database and the right one is empty. To view the groups to which a particular user belongs, you need to select that user in the list. Then the right list displays this user’s groups. If the list remains empty, then it means that this user does not belong to any group. In order to view all groups which are available, you need to switch the tool to a Users for groups mode, by clicking on the corresponding radio button. This will switch the tool to showing the list of all groups in the left panel. When you select a given group, then the right panel shows all users who belong to that group (see Figure 14.2). shows a dialog where the user name and password of the new user must be specified. delete the currently selected user. shows a dialog displaying all available groups. Select one to add the user to it. 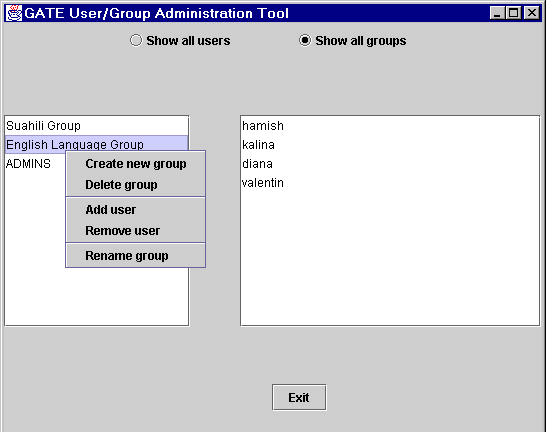 in the given dialog, choose the group from which the user is to be removed. choose another name for the selected user. All changes are automatically written to the Oracle database. shows a dialog where the name of the new group must be specified. delete the currently selected group. shows a dialog displaying all available users. Select one to add to the group. in the given dialog, choose the user to be removed. choose another name for the selected group. In order to work with users and groups3 programmatically, you need to use an access controller, which is the class that provides the connection to the Oracle database. The access controller needs to be closed before application exit. Once the connection is established, you need to create a session by proving the login details of the user (user name, password and group). Any user who can login, can use the accessor methods for users/groups, but only the ADMIN user has priviliges to modify the data. The way to check whether the logged in user has the right to modify data, is to use the isPriviligedSession() method (see below). If a mutator method is used with a non-priviliged session, a SecurityException is thrown. All security-related classes and all their methods are documented in the GATE JavaDoc documentation, java.security package. For a full example of code using the security API, see TestSecurity.java and UserGroupEditor.java. 1Oracle installation is not provided with GATE. You need to purchase this product separately from Oracle Corp. (see http://www.oracle.com). 2This user is similar to the root user in Unix operating systems. 3See the latest API documentation online at: http://gate.ac.uk/gate/doc/javadoc/index.html. User and group API is located in the gate.security package.